Although I’ve been to Italy several times, I’ve always been in too much of a hurry to get to Greece to take that southern detour into Naples. This was my first opportunity to see Pompeii, and I am pleased to report that it is one major tourist destination worth finally seeing in person. Everyone knows something about Pompeii, if only from that pathetic (I mean that in a good way) “Dog of Pompeii” story they make you read in middle school. The eruption of Vesuvius in 79 A.D. is one of the fixed points in history that Doctor #10 goes on about. It’s also an existential wake-up call. One day, everybody’s baking bread and buying beer, when next thing you know, blam! Wiped off the face of the earth. This could happen to you. But of course the best part is how everything going on that day was preserved under the ashes for future generations to dig up and puzzle out. I knew all that, but it’s not the same as being there. Andreas and I found ourselves comparing Pompeii to Jordan’s Petra, where we spent a few days just over a year ago. Petra is another ancient ghost town. 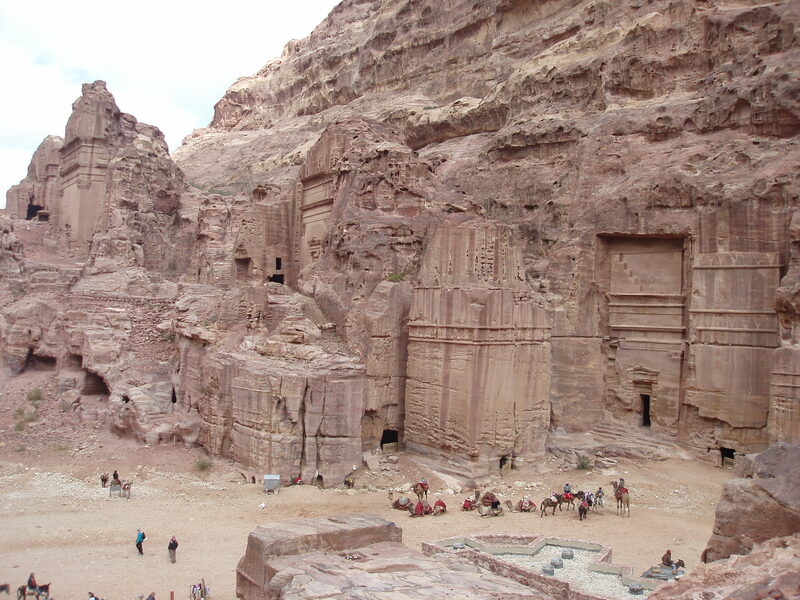 But the magic of Petra is that it feels so oversized, the monumental home of an ancient race of giant gods. Nothing remains of everyday life there, only empty tombs and wind-worn temples of metaphysical belief. Pompeii is more down-to-earth. There you will see graffiti on the walls, a “beware of dog” notice, grape vines in the gardens, and dirty pictures in the bath house. You can imagine yourself walking the streets in the year 79, using the raised crosswalks to stay clear of the muck. You’d meet your friends at the forum, grab lunch at a small sidestreet café, maybe catch a show at one of the theaters, then go home to a colorful house with a fountain in the courtyard. One of our hosts at the hotel told us we could see Pompeii in a couple of hours. She didn’t know us well enough. We wandered around, enthralled, for more than six hours. The guard had to kick us out well after closing time. This entry was posted in Elsewhere and tagged Italy, Pompeii. Bookmark the permalink.